Forest of Dean AC’s annual race started and ended at Ellwood Football Club, and covered a slightly longer route than previously. Forestry work had made sure that there was just the right amount of mud to make things harder. 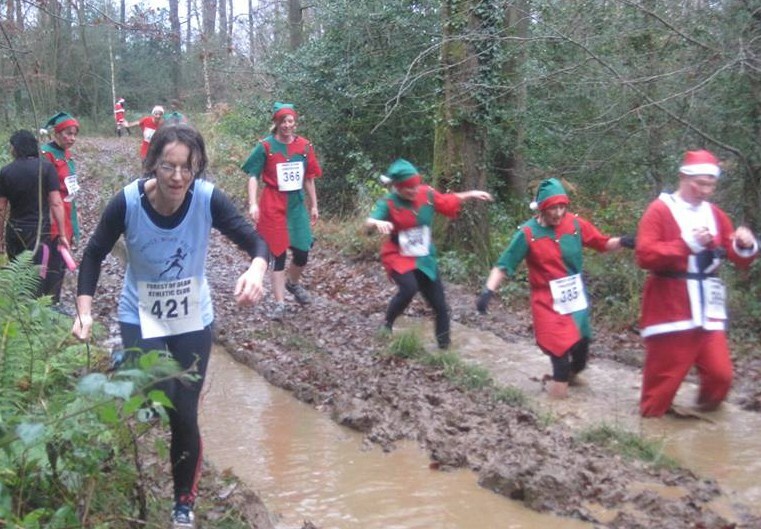 About 120 runners and 30 canicrossers took part. Richard De-Camps (Gloucester AC) repeated his win of 2012, in a time of 34:11, followed by Rob Bowery (Tewkesbury AC) and Leyton Fleet (Forest of Dean AC). Vanessa Lawson (Chepstow Harriers) was first lady in 44:19, followed by Kate Goodhead (Bristol & West AC) and Deborah Phelps (Holme Pierpont). Forest of Dean AC had a clean sweep of the men’s category awards, with John Russell receiving the MV40 award, Bill Turner the MV50 and Chris Moore, the MV60. Rebecca Comins (Chepstow Harriers) won the FV40 award and Alice Lewis (Dursley AC) the FV50. All finishers received an engraved tumbler, a Christmas Cracker and a cup of hot soup. In the Canicross race, Ian Littlewood (Cornwall Harriers) won the men’s race and Evita Gonzale-Seamocki (Westbury Harriers) the lady’s.